Last night we carved Halloween pumpkins, and today we are celebrating the festival of lights (no, not the same one Adam Sandler sang about. I already wrote about that a few years ago…). We have a big Diwali assembly, and so everyone dresses up. Susan loved this particular shade of pink on an outfit she saw, and so asked our maid to have a sari sewn from fabric of that color. Costing literally five dollars, this is her first official sari, and boy does she look good in it! Of course, wrapping something like that is an acquired skill, so we had to wait until we were at school and some of the ladies here could help her, but now she is all good to go! Anyways, this is what we wear today, until we get changed for the Halloween party, and then tomorrow it is lederhosen for Oktoberfest, and on Monday we put on our hiking duds for Week Without Walls. Like I said, a busy few days! 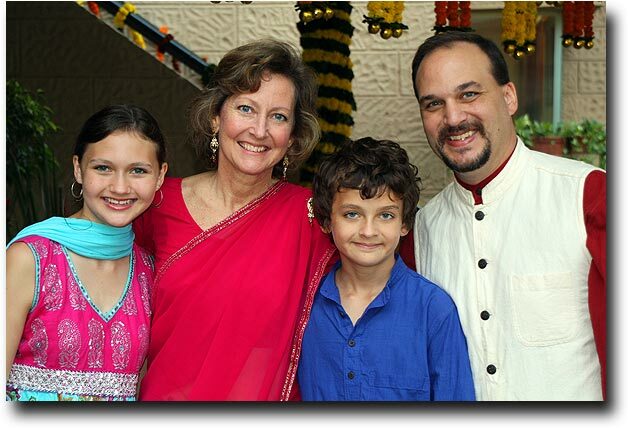 This entry was written by Dave and posted on October 22, 2010 at 8:34 am and filed under Family, Life in India. Bookmark the permalink. Follow any comments here with the RSS feed for this post. Post a comment(Latest is displayed first) or leave a trackback: Trackback URL.